Here we are folks, t’s playoff time! One of the best yet worse times of the fantasy season. Lets be honest, it feels good to make it this far but it’s also stressful to know a few wrong choices on your roster could mean your season is done. I remember last year in the semi-final game I chose to start Kenneth Farrow since Melvin Gordon was out instead of starting Bilal Powell. That day it was announced Forte was starting so I figured Farrow, with a decent matchup, having the bigger workload was a smarter play. Wouldn’t you know it, Forte started but felt like he had less than 5 carries and Powell took the workload and slapped off for 30+ points that day. If I would have started Powell, I would have been on my way to the championship game but instead I was left with a bad taste in my mouth, shower crying and forever hating the name Bilal Powell. Hopefully what happened to me won’t happen to you. So before I continue I gotta say two important things: 1. Go with your gut 2. Play your studs unless your gut tells you otherwise. 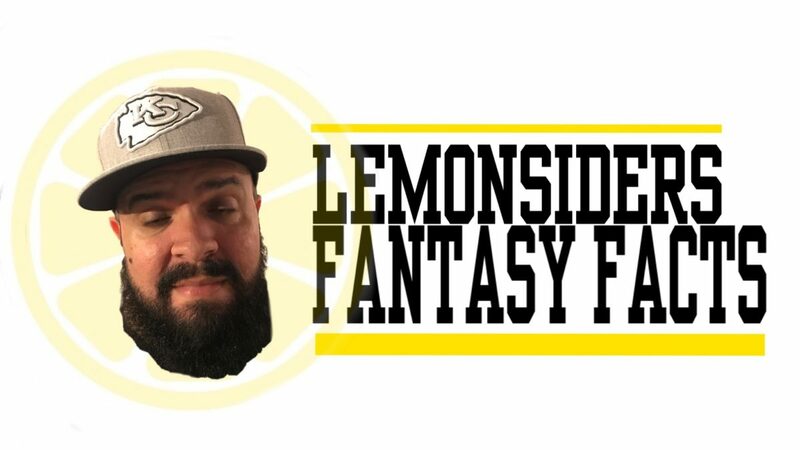 With that being said, let’s slip n slide our way over to the Lemonsiders Fantasy Facts Start, Bust Alert & Sleepers for Week 14. This pertains more to those league owners who are in a pinch. If Tyrod Taylor was your only QB on your roster for the final stretch and you’re in need of a streaming starter, I like Jimmy G this week. His ceiling is not going to be 30+ points but he’s a safe play with a great matchup against the Texans. 15-20 fantasy points are very well in reach against a beaten down defense. Matt Ryan has been a disappointment for fantasy owners all season. In standard league settings, he’s only come close to 20 points in a game just TWICE all season. This week against the Saints, who are 3rd ranked in total yards allowed in passing yards, Ryan isn’t a safe bet. If you have no choice but to use him, my heart goes out to ya. Ever since Rex got back from his injury, he’s been on a hot streak. James White and Mike Gilleslee have become nonexistent and it’s been a Dion Lewis and Rex Burkhead backfield for the Pats. This week they go against the Fins who rank in the bottom half of rush yards allowed. He’s scored 3 TD’s in the past 2 games and I expect him to cross the line at least once this week on the road. Last time Murray was listed on here he went off to score 2 TD’s so maybe this is a good thing for those who have him that he’s on the list again. He’s become very TD dependent and the lack of touches limits his opportunities. Scoring over 20 fantasy points just twice this season, his ceiling isn’t high and his floor is questionable and Derrick Henry is also eating into his workload. You may have to start him, but don’t be surprised if he doesn’t do well. After not having played a game since 2014, Gordon in Week 13 showed up like he hadn’t missed time at all. He was targeted 11 times and finished with 4 receptions and 85 yards against a good Rams pass defense. This week the matchup is much more favorable against GB and it will not surprise me at all if he hit 100+ yards this week and scored a TD. Josh Gordon 7 rec 212 yards 2 TDs. Browns still lose by at least 10 points. Granted, ever since Sherman got injured the Seahawks defense hasn’t been as frightening to fantasy owners but they still have held their own. The Jags passing game has been usable in games against favorable matchups but this is not one of them. Don’t lose hope on Lee though because next week against Houston at home he should bounce back strong after more than likely struggling this upcoming week. Witten has always been a Giants killer and he torched them in this years opening game too. The Giants have allowed the most touchdowns to TE’s and with Witten always being a safe security blanket, fire up the NFL’s best dad runner this week against the G-men. Last week we had Austin Sefarian Jenkins as a bust going against KC and he finished with 2 receptions and 7 yards. Cook hasn’t hit double digits since Week 9 despite extremely favorable matchups since then and against a defense that’s tough against tight ends, I rather take a flier with someone else than go with Cook. Whenever a teams defense goes against Cleveland they are always worth a start. If the Packers are on your waiver wire, pick them up for this week since the Browns give up the 2nd most points to defenses. It’s a no brainer plug and play. Dolphins defense last week exploded against the Broncos for 25+ points but this week against the Patriots? Pfft. That’s not going to happen. I know the Dolphins have given the Patriots problems over the years in home games but to roll out the Dolphins defense against the Pats in your fantasy playoffs isn’t smart at all. Miami Dolphins professional football franchise: missing since ~2003. If found please return, their fans miss them. With Jimmy G slinging it, Robbie Gould ended up with 5 FG’s against the Bears. I feel great about Jimmy G being able to move the ball more on Houston than he did against the Bears so I definitely feel good about Robbie Gould’s opportunities this week. He may not get 5 FG attempts but double-digit fantasy points is very reasonable. The Jaguars defense at home is going to be a rough one for Russel Wilson and the Seattle offense. I’d look to use a kicker that has a better matchup because the Jags defense is as rough as it gets to move the ball on. Can’t feel too good about depending on anyone from Seattle’s offense to help you get a fantasy win.